This explorative research investigates the impact of visual elementsin advertising, especially dominant colors, on brand personality.An experimental study was conducted to suggest the links between colors(red, yellow, green, blue, purple, and black; Munsell, 1966) and thefive brand personality dimensions (Sincerity, Excitement, Competence,Sophistication, and Ruggedness; Aaker, 1997), and examine the effectsof colors on building brand personality. The results suggest that yellowis strongly associated with both Sincerity and Excitement dimensionsof brand personality. In addition, the results show that red increasescompetent, sophisticated, and rugged personality associations. The resultssupport the idea that certain dominant colors in advertisements lead to thegeneration of a particular brand personality. To this day, the symbolic meaning attributed to brands has received considerable attention in marketing research. In particular, the concept of brand personality, defined as “the set of human characteristics associated with a brand” (Aaker, 1997, p. 347), has received increased attention from both scholars and practitioners in the fields of advertising, marketing, and consumer psychology. A number of empirical studies suggest that the concept of brand personality is very important for marketing scholars and practitioners as it can be a powerful and effective way for marketers to persuade and to establish meaningful relationships with consumers (e.g., Aaker, 1999; Biel, 1993; Plummer, 1985; Sirgy, 1982; Sung & Kim, 2010; Sung & Tinkham, 2005). In addition, well-defined and established brand personalities offer self-expressive benefits and symbolic meanings to consumers (Aaker, 1999; Sirgy, 1982). Consumers express their selfconcepts through the consumption of commercial brands and tend to choose brands with personality characteristics that are matched to their own personalities (Aaker, 1997; Escalas & Bettman, 2003; Sirgy, 1982; Sung & Choi, 2012). David Aaker (1996) suggests that a brand’s personality is created and maintained by both product-related and non-product-related factors. For example, brand personality can be determined by such product-related factors as product category, name, logos, package design, price, and other physical attributes as well as by non-product-related characteristics like user imagery, employees or CEO image, celebrity endorsers, and culture. More importantly, a brand personality can be created over time by the entire mix of marketing communication variables such as advertising (Aaker, 1996). Thus, it seems reasonable to suggest that every element of advertising should be considered as a contribution to the brand personality (Batra, Lehmann & Singh, 1993). These elements include verbal elements, nonverbal elements, and the medium in which the ad is placed (Batra et al., 1993). Despite the importance of and the increased attention to the concept of brand personality in advertising theory and practice, limited research has been conducted to identify the antecedents of brand personality (Aaker, 1997). In particular, very limited research has been conducted to understand the extent to which the advertising variables influence the creation and forming of the commercial brands’ personalities (Sung & Kim, 2010). As suggested by David Ogilvy (1966, p. 178), “Every advertisement must be considered as a contribution to the complex symbol which is the brand image—as part of the long term investment in the reputation of the brand.” Such elements include verbal elements (e.g., text copy), nonverbal elements (e.g., typography, colors), and the medium in which the ad is placed (Batra et al., 1993). Among the nonverbal elements, color, which occupies more than 80% of visual elements (Walker, 1993), is one of the most important visual and non-verbal elements of advertising in the persuasion process (Johnson, 1992; Mahnke, 1996). Colors, which also have a number of emotional perspectives, can convey a variety of symbolic meanings that consumers attribute to a brand (McCracken, 1989). In particular, color carries out one of the symbolic functions in advertisements (Lutz & Lutz, 1977; Tavassoli, 2001). Thus, color as a nonverbal element in advertisements is one of the antecedents for building a brand personality, which is an important symbolic brand association (Aaker, 1997). Given color’s great potential value for advertisers and brand managers, the purpose of this study is to investigate the roles of colors used in advertising in determining brand personality and conceptualize color as an important antecedent of brand personality. More specifically, by employing the Munsell Color System (Munsell, 1966), the current research investigates the effects of colors on the five brand personality dimensions (Sincerity, Excitement, Competence, Sophistication, and Ruggedness) identified by Aaker (1997). Therefore, this research will interweave the dimension of brand personality with the color framework. The present study provides the chance to consider the nonverbal elements as key variables, especially colors, with the brand personality and focuses on color as a determinant variable in terms of building the brand personality. The investigation of the impact of color on brand personality, which has received attention but limited empirical testing, would provide both theoretical and practical implications for advertising scholars and practitioners. From a theoretical perspective, this study extends the application of brand personality toward the more symbolic meaning and shows the relationship between brand personality and color. From a managerial perspective, it attempts to prove that color enables consumers to evoke some perceptions and play a part in the role of building a particular brand personality. The results allow advertisers to gain important practical insights into the role of color in brand personality. Therefore, marketers and brand managers consider color as a critical antecedent, which is related to brand personality, and then employ colors to develop their brand images and brand equity. As a result, we will better understand how and which colors relate to a dimension of brand personality and, consequently, influence branding in advertising. The symbolic meaning that brands acquire is often called brand personality (Aaker, 1997). Brand personality could be regarded as the aggregation of human characteristics that are associated with a brand (Aaker, 1997) and the transference of human personality to brand constructs of brand personality (Plummer, 1985). Regardless of a product’s own attributes, consumers may imbue a brand with human personalities or certain anthropomorphic traits (Levy, 1985; Sung & Tinkham, 2005), think of particular brands as they associate them with one’s own self (Fournier, 1994, 1998), or use brands as a symbol. Consequently, brand personality tends to serve a symbolic use for a brand, which interrelates to a consumer’s personality (Escalas & Bettman, 2005). Earlier researchers showed that the personality of brands enables consumers to present themselves (Belk, 1988) and an individual’s ideal self (Malhotra, 1988) by using a specific brand. Therefore, advertisers often make use of this brand personality to establish an effective strategy for their targeted consumers. Marketing or brand managers also regard brand personality as both a means of differentiating a brand (Vernadakis, 2000) and as a common attribute for their marketing activities across cultures (Aaker, Benet-Martines, & Garolera, 2001; Sung & Tinkham, 2005). A well-established brand personality increases positive impressions and the perception of being valuable to consumers (Biel, 1993; Sirgy, 1982). Consequently, it enhances the level of brand trust and brand affect, thereby increasing brand loyalty and building long-term consumer-brand relationships (Fournier, 1998; Sung & Kim, 2010; Sung & Tinkham, 2005). Brand personality is considered as an effective way to build and enforce the relationship between the brand and the consumer (Sung & Tinkham, 2005). The development of a theoretical framework of brand personality (i.e., Big-Five brand personality dimensions; Aaker, 1997) offers a new way for advertising researchers to empirically examine the symbolic meaning and role of brands in consumer behavior. Aaker (1997) identified five brand personality dimensions (Sincerity, Excitement, Competence, Sophistication, and Ruggedness) and demonstrated that her five dimensions and 42 personality traits are generalizable, valid, and reliable by representing the 42-item brand personality scale with 15 facets (Aaker 1997). A considerable number of studies corroborate that commercial brands can be associated with human personality traits (e.g., Aaker, 1997; Escalas & Bettman, 2005; Levy, 1959; Plummer, 1985). Even though brand personality has a similar definition to that of the human personality traits and is associated with them, the way they are created differs (Aaker, 1997; Sung & Tinkham, 2005). Researchers have suggested that a brand’s personality is created and shaped by any direct and indirect contact that the consumer experiences with the brand (McCracken, 1989; Plummer, 1985; Shank & Langmeyer, 1994). Specifically, brand personality is created primarily by the marketing mix (4P’s) such as marketing communications, advertising, sponsorship, product placement, packaging, price, distribution, logo, celebrity endorser, etc. (Batra et al., 1993). In addition, it can be formed and influenced by the consumer’s own experience, CEO’s image, typical users of brands, word-of-mouth (WOM), and cultural background (Aaker, 1997; Batra et al., 1993; Sung & Tinkham, 2005). As Aaker (1996) suggested, advertising and its every element could be substantial factors affecting a brand’s personality. For example, spokespersons employed in advertisements can be antecedents which have personalities of the brand. Over time, the personalities or the meanings which the spokespersons convey are transferred to the brand. According to McCracken’s (1989) model of meaning transfer, such symbolic meanings generated by consumers will be transferred to brands through the mix of marketing communications and the media (Escalas & Bettman, 2005). Advertising, which represents the brand’s meanings and the brand’s claim, can help create the brand personality and help convey meanings to consumers. Thus, it can be assumed that advertising and its elements play significant roles in creating and maintaining brand personality (Batra et al., 1993). In this light, there can be a question as to whether colors, as attributes related to advertising style, can influence the forming of brand personality, and as to how colors can be transferred to the brand with personality. Research of nonverbal elements has a long history in both communications and psychology. For example, Lutz and Lutz (1977) asserted that the recipients presented with an image have significantly higher recall (brand name) scores than those not presented with an image. Thus, they contended that the use of a picture or image in ads affects the recipients’ learning and memory. Similarly, Rossiter and Percy (1980) provided empirical evidence that brand attitude could be influenced by nonverbal (or visual) elements. They asserted that the persuasive function of visual contents in advertisements is more critical than verbal contents on attitude change and that the visual content is more effective in creating a favorable attitude toward the brand than the verbal belief (Rossiter & Percy, 1980). All kinds of visual elements in advertising are important in creating consumer response and persuasion as well as in cognitive and affective processing (DeRosia, 2008; Meyers-Levy & Peracchio, 1995). In the visual elements, there are shapes, colors, typography, materials, and symbols (Lucas & Britt, 1950), which directly or subliminally create meanings and convey brands’ values and personality traits to consumers (Orth & Malkewitz, 2008). Successful usage of visual elements for a brand in advertising can generate a memorable experience for the consumer (Aaker, 1996), build brand personality, and encourage brand recall (Lucas & Britt 1950; Kleinbard & Erdelyi, 1978; Tavassoli, 2001). Color helps products get more attention from the consumer (Lucas & Britt, 1950; Meyers- Levy & Peracchio, 1995; Sara, 1990; White, 1997), provides information value (Lutz & Lutz 1977; Rossiter & Percy, 1980), increases motivation or participation (White, 1997), and elicits brand recognition (Tavassoli, 2001; White, 1997). For example, a study found that the impact of color is critical to brand marketing as it increases brand recognition by up to 80% (Morton, 2005). In addition, Macklin (1996) suggested that packaging color could be an influential brand-name retrieval cue for children. Along similar lines, since color can increase the perceived attractiveness of the products in ads, consumers are likely to create more positive attitudes toward ads in color rather than the same ads in only black and white (Meyers-Levy & Peracchio, 1995). Since colors create attitudes and perceptions, color can become an additional language in advertising and in visual persuasion (Middlestadt, 1990). In terms of practical usages of color in advertising, researchers have demonstrated that color has three significant roles in advertising: “attention to color,” “realism through color,” and “emotional effect of color” (Lucas & Britt, 1950). The third role is the emotional stimulation and excitement from colors. Furthermore, as the affective responses of colors are subjective and are based on previous experiences of the consumer (Lucas & Britt, 1950), consumers may add their own value to the color in the advertisements and simultaneously get impressions from the advertising. Since color is one of the most influential visual elements in the composition of advertisements (Meyers-Levy & Peracchio, 1995), the appropriate usage and the suitability of color have a great effect on consumers’ emotion or psychology for persuasion (Tavassoli, 2001), and can exert a strong stimulus on a user’s perceptions (Lucas & Britt, 1950). Accordingly, color can be important in self-expression and in impression formation (Hemphill, 1996). People use colors to express themselves and their emotions. For example, when people need to pick out a color for their clothes or cars, they choose it based on the way they want to be shown to others (Trinkaus, 1991) and, in this light, their personality traits also are shown to influence the color choice (Choungourian, 1972). According to the CCI Color Institute for Color Research, when people subconsciously evaluate a person, environment, or product, it takes only about 90 seconds of initial viewing and between 62% and 90% of the evaluation depends on color alone (Morton, 2005). As previous studies have suggested, colors can be important factors that have an impact on brand attitude and advertising attitude (Meyers-Levy & Peracchio, 1995; White, 1997). They have an undeniable effect on consumers’ emotional perspectives and persuasion (Lucas & Britt, 1950; Tavassoli, 2001). The Munsell Color System, one of the numerous color systems that exist, is widely known and used for its precise identification process (Ballast, 2002). It was developed by Albert H. Munsell in 1905 and became the official color reference system in early 1940’s. According to the Munsell Color System, each color has three basic attributes: hue, value (brightness), and chroma (saturation), and can be identified with the numbers of hue, value, and chroma such as 5R 5/14 (Munsell, 1966). Hue refers to simple color tones such as red, blue, and yellow. Red, yellow, green, blue, and purple are identified as the five principal hues in the Munsell Color System. Value (brightness) refers to the degree of darkness or lightness of the color, extending from white to black. Chroma (saturation) of color describes the degree of purity of the color; it is the amount of pigment in a color, and it can be explained as the mixing of white with a color, which reduces the saturation of color (Lucas & Britt, 1950; Ballast, 2002). For example, a fairly saturated color generally called as red would be 5R 5/14 with 5R meaning the color in the middle of the red hue, 5 meaning medium lightness, and a chroma of 14. The mixing of a color with white not only raises the brightness but also reduces the saturation of the color. When a color is mixed with black, it reduces the brightness as well as the saturation. A large number of studies about perceptions of color have been conducted (e.g., color-emotion associations; Ballast, 2002; Birren, 1978, 1980; Hemphill, 1996; Terwogt & Hoeksma, 2001; Wexner, 1982; color preference; Guilford & Smith, 1959; Mahnke, 1996; Rosenbloom, 2006; Saito, 1996). Considering the effects of colors on emotional states, colors may cause rather diverse reactions (Satio, 1996). For example, red is described as passionate, exciting, fervid, stimulating, and active in its objective impressions (Birren, 1980; Ballast, 2002; Davey, 1998), has stimulating, strong, and powerful images in the agreeable associations, and bloody, aggressive, disturbing, and sensuous images as unpleasant associations (Birren, 1978, 1980). Red symbolically is known as a dominant, arousing, and dynamic color (Mahnke, 1996). Yellow has been described as sunny, incandescent, expectant, expansive, and radiant in its general appearance, and as cheerful, joyous, happy, optimistic, inspiring, sociable, friendly, vital, and celestial in its objective impression (Birren, 1978, 1980). Green is associated with a tender-soothing, relaxing impression, and with refreshment, naturalness, tranquility, peacefulness, growth, health, stability, calm, and sincerity in its objective impressions (Birren, 1980; Ballast, 2002). Blue is represented as subduing, melancholy, contemplative, confident, stable, secure, and sober in its objective impressions (Birren, 1980) and represents the rationality, logic, and serenity of humans (Birren, 1978; Lucas & Britt, 1950). Purple is represented as dignified, pompous, mournful, and mystic in the objective impressions (Birren, 1978, 1980), and is often associated with nobility, royalty, wealth, wisdom, spirituality, nostalgia, ceremony, and arrogance (Lucas & Britt, 1950). Black is perceived as powerful, strong, and masterful (Valdez & Mehrabian, 1994), and it also has an agreeable association of sophistication and modernity, but it also may be considered as an ominous, empty, and fatal color in unpleasant associations (Birren, 1978; Mahnke, 1996; Wexner, 1982). Each perception and image from a color differs among individuals, generations, and cultures (Lucas & Britt, 1950). Nevertheless, colors generally share common perceptions and emotions evoked by color (Lucas & Britt, 1950). In spite of considerable interest in people’s reactions to color, it is a little difficult to hypothesize specific relationships among five main colors and brand personality dimensions with reliable theories. However, the research reviewed allows us to assume that some colors might induce a particular brand personality with general patterns of color frameworks in the minds of consumers. 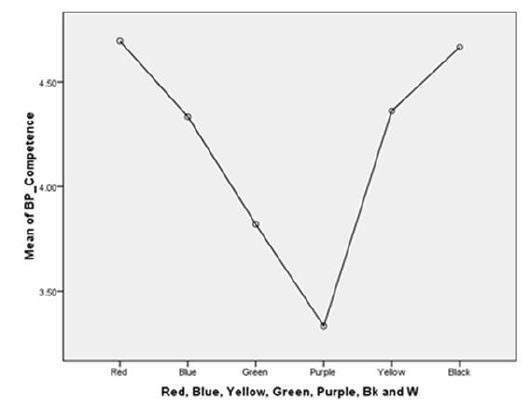 Therefore, this explorative research examines whether there are any relationships between the colors (i.e., red, yellow, blue, green, purple, and achromatic color: black) in advertisements and the five brand personality dimensions (i.e., Sincerity, Excitement, Competence, Ruggedness, and Sophistication) when controlling for other antecedents of brand personality. Based on the conceptual backgrounds already mentioned, those who were exposed to an advertisement containing one dominant color would have certain feelings or thoughts and the advertisement containing a dominant color would elicit specific reactions from consumers with regard to brand personality. As previously mentioned regarding experimental research of color, red and yellow elicit more arousing, active, exciting, and stimulating emotions than blue and green (Mehrabian, 1974; Valdez & Mehrabiab, 1994; Wexner, 1982; Wilson, 1966), and red and yellow have dominant and dynamic color associations (Mahnke, 1996). Red and yellow are more associated with anxiety, displeasure, and high arousal than are blue and green, whereas blue and green are more pleasant than red and yellow (Guildford & Smith, 1959; Jacobs & Suess, 1975; Valdez & Mehrabian, 1994; Wexner, 1982; Wilson, 1966). On the other hand, green and blue comprise the highest preference, when brightness and saturation are held constant (Guildford & Smith, 1959; Mehrabian, 1974; Valdez & Mehrabiab, 1994). Therefore, the research questions of this study are: what are the relationships between the color in advertisements and the brand personality when controlling for other antecedents of brand personality, and how do the colors that evoke consumers’ perceptions in advertisements exert an impact on brand personality? Finally, the question remains—which color has an influence on a particular brand personality? Based on most early studies, it could be expected that the dominant color in an ad would have a significant influence on the building of brand personality. Therefore, the current research empirically explores how the reactions to the dominant color hue (e.g., red, yellow, blue, green, purple, and black) in advertisements would have an impact on brand personality dimensions. A watch was selected as the advertised product for the current study. The selection of a watch seems appropriate for the current study because it is a self-expressive product that tends to have a variety of brand personalities and it is not a gender-specific product (Aaker, 1997). However, a specific fictitious brand name was not provided to the subjects. Prior research suggests that consumers can infer the personalities of brands even with very limited information (e.g., brand name) (Sung & Choi, 2012). To control for such confounding effects, no brand name was provided in the experiment stimuli of the study (i.e., advertisement). Instead, the watch was introduced as a new brand being considered for introduction in the U.S. market. A total of 138 college students from a large southeastern university participated in the study. All participants were given extra course credit as an incentive. The participants ranged from 18 to 31 in age (M = 20) and were composed of 102 (73.9%) females and 36 (26.1%) males. Of the total, 56.5% were Anglo American, 16.7% Hispanic American, 15.2% Asian American, and 3.6% were African American. An experimental design was used to explore whether color indeed affects the perceptions of consumers in advertising and helps make a certain personality of the advertised brand. Participants were fully exposed to a color magazine ad through a Web survey site, after which the selfreport was used to measure the participants’ perceptions of color and five brand personality dimensions. Specifically, participants were simply told that they were dealing with “opinions about the magazine advertisement for a newly introduced wristwatch brand.” All participants were randomly assigned to one of the six different conditions. After viewing the ad with one dominant color, they were asked to rate the fictitious brand in terms of the five brand personality dimensions. Finally, as a manipulation check, they were asked to identify the dominant color of the ads. All (100%) of the participants identified the dominant color correctly. The current study utilized Aaker’s (1997) 15 (out of 42) personality traits representing the five brand personality dimensions to measure personality of the advertised brand. Both Sincerity and Excitement were measured with four traits, respectively (Sincerity: down-to-earth, honest, wholesome, cheerful; α = .73; Excitement: daring, spirited, imaginative, up-to-date; α = .83). In addition, Competence was measured with three traits (reliable, intelligent, and successful; α = .84). Finally, two items were used to measure Sophistication (upper class and charming; α = .70) and Ruggedness (tough and outdoorsy; α = .44). These items were measured based on seven-point ratings of agreement (1 = not at all descriptive, 7 = perfectly descriptive). Sincerity. The results of the ANO VA suggest that there was a significant effect of colors on the Sincerity dimension: F (5, 132) = 2.88, p < .05. The nature of this effect was further examined using a Tukey HSD pairwise comparisons test. As shown in Table 2, the results indicate that the mean score for the yellow color ad (M = 3.89, SD = 1.21) was significantly higher than that of black (M = 2.93, SD = 0.98, p < .05). However, the mean scores of the four colors were relatively similar: red ad, M = 3.74, blue ad, M = 3.72, green ad, M = 3.51, and purple ad, M = 3.03. In sum, the results suggest that the participants who were exposed to the advertisement in yellow showed the highest mean scores for the Sincerity dimension. Excitement. An ANOVA on the Excitement dimension yields a significant effect of colors (F (5, 132) = 5.42, p < .01). As shown in Figure 2, individuals in the yellow condition showed the highest exciting feeling (M = 5.13, SD = 1.02), followed by red (M = 5.10, SD = 0.81), green (M = 3.99, SD = 1.51), blue (M = 3.93, SD = 1.46), purple (M = 3.82, SD = 1.55), and black (M = 3.80, SD = 1.38). The results of the Tukey HSD pairwise comparisons test suggest that the mean score for the yellow ad (M = 5.13, SD = 1.02) was significantly higher than those of the purple ad (M = 3.82, SD = 1.55, p < .05), the black ad (M = 3.80, SD = 1.38, p < .05), the blue ad (M = 3.93, SD = 1.46, p < .05), and the green ad (M = 3.99, SD = 1.51, p < .05). Similarly, the mean score for the red ad (M = 5.10, SD = 0.81) was significantly higher than those of the purple (M = 3.82, SD = 1.55, p <.05), the black (M = 3.80, SD = 1.38, p < .05), and the blue ads (M = 3.93, SD = 1.46, p < .05). Competence. The results of the ANOVA suggest that there was a significant effect of colors on the Competence dimension: F (5, 132) = 4.06, p < .05. The results of the Tukey HSD test indicate that the mean score for the red color ad (M = 4.70, SD = 1.02) was significantly higher than that of the purple ad (M = 3.33, SD = 1.66, p < .05). Further, there was a significant difference between the black ad (M = 4.67, SD = 1.29) and the purple ad (M = 3.33, SD = 1.66, p < .05) (see Table 2). However, the mean scores of the three colors were relatively similar: blue ad, M = 4.33; green ad, M = 3.82; and yellow ad, M = 4.36 (see Figure 1). All considered, these results suggest that the individuals who were exposed to the advertisement in red showed the highest mean scores for the Competence dimension. Sophistication. An ANOVA on the Sophistication dimension does not yield a significant effect of colors (F(5, 132) = 1.45, p = .21), indicating that the ads did not significantly differ on the Sophistication dimension. The mean scores of the six colors were relatively similar: red ad, M = 4.22; blue ad, M = 3.77; green ad, M = 3.46; purple ad, M = 3.33; yellow ad, M = 3.96; and black ad, M = 4.10. Ruggedness. The results of the ANOVA suggest that there was a significant effect of colors on the Ruggedness dimension: F (5, 132) = 5.09, p < .01. The results of the Tukey HSD test indicate that the mean score for the red ad (M = 3.09, SD = 1.23) was significantly higher than that of purple (M = 1.71, SD = 1.08, p < .01) and the mean score for the yellow (M = 3.08, SD = 1.28) was significantly higher than the purple ad (M = 1.71, SD = 1.08, p < .01); the mean score for the green (M = 3.00, SD = 1.19) was significantly higher than the purple ad (M = 1.71, SD = 1.08, p < .01). However, the mean scores of the two colors were relatively similar: blue ad, M = 2.71 and black ad, M = 2.38). Specifically, the results suggest that the participants who were exposed to the advertisement in red showed the highest mean scores for the Ruggedness dimension. Overall, the results showed that different colors had differential effects on the five brand personality dimensions, respectively. As a result, four dimensions of brand personality had a significant effect from the colors on the brand personality dimension at the p < .05 level except the Sophistication dimension. Table 2 shows the means and standard deviations for the five brand personality dimensions. Visual elements such as layout, color, typography, and symbols in advertising directly or subliminally convey the brands’ values, images, and personality traits to consumers (Orth & Malkewitz, 2008). Advertisers can generate an emotional connection, whether it is a positive or negative impression, between brand and consumers through these visual elements (Aaker, 1996; Kleinbard & Erdelyi, 1978). Efficient use of visual elements in advertising can generate a memorable experience for the consumer (Aaker, 1996), build brand personality, and encourage brand recall (Lucas & Britt, 1950; Kleinbard & Erdelyi, 1978; Tavassoli, 2001). The purpose of the current study was to examine the effects of color hues on brand personality in advertising. The present study’s findings show that color influences consumers’ perceptions of the brand or product in the advertisements and helps create a certain personality in the advertised brand. Thus, this research provides some empirical evidence showing that colors in advertising can be an important antecedent to brand personality. The overall findings reveal that colors have significant effects on four dimensions of the brand personality: Sincerity, Excitement, Competence, and Ruggedness. That is, both the sincere and exciting brand personality traits are influenced by the color yellow, which is known as a cheerful and exciting color (Birren, 1978, 1980). Further, competent, sophisticated, and rugged brand personality traits are strongly associated with the color red, which is known as a passionate or dynamic color (Birren, 1980; Mahnke, 1996). One of the interesting findings is that subjects in the red condition showed higher mean scores in the Ruggedness dimension of brand personality than those in the black condition. One possible reason for the result could be that the personality traits of the brand advertised in red coincides with the red color perceptions of being dominant and dynamic (Mahnke, 1996), and with its associated qualities of being passionate, fervid, and active (Birren, 1978, 1980). Overall, the results of the study suggest that some brand personality dimensions are significantly influenced by colors used in advertising. As stated by Tavassoli (2001), colors can take on an important role in positioning a brand and in building or reinforcing a brand personality as a point of differentiation from competitors. Colors have both perceptive and affective responses and this information could be useful when creating a marketing or persuasion strategy. A certain color can create certain perceptions for the consumer, and it can stimulate and develop a certain brand personality. From a theoretical perspective, this study tried to investigate the brand personality construct in more affective and symbolic meaning conditions and dealt with colors as the key variables related to the building of brand personality. Considering the role of color as the antecedent of brand personality in ads, this study shows that there is a relationship between them and that colors can influence the formation of certain brand personalities. The results of the present research conceptualize color as an important antecedent of brand personality and investigate the predictive roles of color in formation of brand personality. Therefore, this study expands the understanding of the antecedent of brand personality. Colors often are selected arbitrarily in practical advertisements and are employed without considering the consumers’ perceptions of a brand intended by marketers (Singh, 2006; Tutssel, 2001). From a managerial perspective, the current study attempts to prove that color enables consumers to evoke some perception and can play an important role in the building of a particular brand personality intended by marketers. Consequently, marketers and brand managers can first consider color as a critical variable which is related to the building of the brand personality and then utilize the impact of color to develop the brand image or to increase brand equity. The practical implication of this insight for managers responsible for the marketing of brands or products is to have an understanding of the effect color has on a specific brand personality. Several limitations of this study should be considered for future research. First, the use of a college student sample may limit the ability to generalize the findings. Also, it should be noted that the sample of this study was 73.9% female. Prior research suggests that there are some gender differences in color preferences (e.g., Birren, 1980). In addition, this study relied on a single product category (wristwatch). Thus, further research with a larger set of self-expressive product categories and a well-balanced, representative sample in gender proportion is needed to increase the validity of the results. More importantly, while color hue was manipulated in the current study, neither brightness nor saturation was manipulated. Furthermore, monitors used by subjects to participate in the current study online were not controlled. That is, advertising colors presented in their own computer monitors could vary depending upon their personal color settings. Therefore, a more systematic and direct investigation into combinations of hue, brightness, and saturation impacting brand personality is necessary. Finally, the reliability of the Ruggedness dimension measures (i.e., two items: tough and outdoorsy) was only .44. Additional studies are warranted to address these reliability issues. Within the limits of the study, the current study’s findings concerning the effect of color on brand personality have implications for the relationships between dominant color and brand personality traits in ads and the consideration of colors as the antecedents of brand personality. 1.Aaker, D. A. (1996). Building strong brands. New York: The Free Press. 2.Aaker, J. L. (1997). Dimensions of brand personality. Journal of Marketing Research, 34 (August), 347–356. 3.Aaker, J. L. (1999). The malleable self: The role of self-expression in persuasion. Journal of Marketing Research, 36 (February), 45–57. 4.Aaker, J. L., Benet-Martinez, V., & Garolera, J. (2001). Consumption symbols as carriers of cultures: A study of Japanese and Spanish brand personality constructs. Journal of Personality and Social Psychology, 81 (3), 492–508. 5.Ballast, D. K. (2002). Interior design reference manual. Belmont, CA: Professional Pub. Inc.
6.Batra, R., Lehmann, D., & Singh, D. (1993). The brand personality component of brand goodwill: Some antecedents and consequences. In D. A. Aaker, & A. Biel (Eds. ), Brand equity and advertising. Hillsdale, NJ: Lawrence Erlbaum Associates. 7.Biel, A. (1993). Converting image into equity. In D. A. Aaker, & A. Biel (Eds. ), Brand equity and advertising. Hillsdale, NJ: Lawrence Erlbaum Associates. 8.Birren, F. (1978). Color in your world. New York: Macmillan Publishing Co., Inc.
9.Birren, F. (1980). Color psychology and color therapy. Secaucus, N.J.: The Citadel Press. 10.Choungourian, A. (1972). Extraversion, neuroticism, and color preference. Perceptual and Motor Skills, 34, 724–726. 11.Davey, P. (1998). True color: The glorious poly-chromy of the past suggests a strong historical need for color, despite current reductive fashions. The Architectural Review, 204, 34–36. 12.DeRosia, E. D. (2008). The effectiveness of nonverbal symbolic signs and metaphors in advertisements: An experimental inquiry. Psychology & Marketing, 25 (3), 298-316. 13.Erdelyi M. H., & Kleinbard, J. (1978). Has ebbinghaus decayed with time? The growth of recall over days. Journal of Experimental Psychology: Human Learning and Memory, 4, 275-289. 14.Escalas, J. E., & Bettman, J. R. (2003). You are what they eat: The influence of reference groups on consumers' connections to brand. Journal of Consumer Psychology, 13, 339-348. 15.Escalas, J. E., & Bettman, J. R. (2005). Self-construal, reference groups, and brand meaning. Journal of Consumer Research, 32 (December), 378-389. 16.Fournier, S. (1994). A consumers-brand relationship frame-work for strategy brand management. unpublished doctoral dissertation, University of Florida. 17.Fournier, S. (1998). Consumers and their brands: developing relationship theory in consumer research. Journal of Consumer Research, 24 (March), 343–374. 18.Guilford, J. P., & Smith, P. C. (1959). A system of color preference. American Journal of Psychology, 72, 487-502. 19.Hemphill, M. (1996). A note on adults' color-emotion associations. Journal of Genetic Psychology, 157 (3), 275-281. 20.Johnson, V. (1992). The power of color. Successful Meetings, 41 (7), 87-90. 21.Levy, S. J. (1985). Dream, fairy tales, animals, and cars. Psychology & Marketing, 2, 67-81. 22.Lucas, D. B., & Britt, S. H. (1950). Advertising Psychology and Research, McGraw-Hill Book Company. 23.Lutz, K. A., & Lutz, R. J. (1977). The effects of interactive imagery on learning: Application to advertising. Journal of Applied Psychology, 62, 493-498. 24.Macklin, M. C. (1996). Preschoolers' learning of brand names from visual cues. Journal of Consumer Research, 23, 251-261. 25.Mahnke, F. (1996). Color, Environment, Human Response. New York: Van Nostrand Reinhold. 26.Malhotra, N. K. (1988). Self concept and product choice: An integrated perspective. Journal of Economic Psychology, 9, 1-28. 27.McCracken, G. (1989). Who is the celebrity endorser? Cultural foundations of the endorsement process. Journal of Consumer Research, 16 (December), 310–21. 28.Mehrabian, A., & Russell, J. A. (1974). An Approach to Environmental Psychology, Cambridge, MA: MIT Press. 29.Mehrabian, A. (1978). Measures of individual differences in temperament. Educational and Psychological Measurement, 38, 1105-1117. 30.Meyers-Levy, J., & Peracchio, L. A. (1995). Understanding the effects of color: How the correspondence between available and required resources affects attitudes. Journal of Consumer Research, 22, 121-138. 31.Middlestadt, S. E. (1990). The effect of background and ambient color on product attitude and beliefs. Advances in Consumer Research, 17, 244-249. 33.Munsell, A. H. (1966). A Munsell Color Product, Kollmorgen Corporation, New York. 34.Ogilvy, D. (1951). Speech to American marketing association annual meeting. AMA proceedings, Chicago: American Marketing Association. 35.Ogilvy, D. (1966). Confessions of An Advertising Man, New York: Atheneum. 36.Orth, U. R., & Malkewitz, K. (2008). Holistic package design and consumer brand impressions. Journal of Marketing, 72 (May), 64-81. 37.Plummer, J. T. (1985). How personality makes a difference? Journal of Advertising Research, 24, 27-31. 38.Rosenbloom, T. (2006). Color preference of high and low sensation Sseekers. Creativity Research Journal, 18, 229-235. 39.Rossiter, J. R., & Percy, L. (1980). Attitude change through visual imagery in advertising. Journal of Advertising, 9, 10-16. 40.Sara, R. (1990). Packaging as a retail marketing tool. International Journal of Physical Distribution & Logistics Management, 20 (8), 29-30. 41.Satio, M. (1996). Comparative studies on color preference in Japan and other Asian regions, with special emphasis on the preference for white. Color Research and Application, 21(1), 35-49. 42.Shank, M. D., & Langmeyer, L. (1994). Does personality influence brand image? Journal of Psychology, 128, 157-164. 43.Singh, S. (2006). Impact of color on marketing. Management Decision, 44 (6), 783-789. 44.Sirgy, M. J. (1982). Self-concept in consumer behavior: A critical review. Journal of Consumer Research, 9 (December), 287-300. 45.Sung, Y., & Kim, J. (2010). Effects of brand personality on brand trust and brand affect. Psychology & Marketing, 27 (7), 639-661. 46.Sung, Y., & Choi, S. M. (2012). The influence of self-construal on self-brand congruity in the United States and Korea. Journal of Cross-Cultural Psychology, 43 (1), 151-166. 47.Sung, Y., & Tinkham, S. F. (2005). Brand personality structures in the United States and Korea: Common and culture-specific factors. Journal of Consumer Psychology, 15 (4), 334–350. 48.Tavassoli, N. T. (2001). Color memory and evaluations for alphabetic and logographic brand names. Journal of Experimental Psychology, 7 (2) 104-111. 49.Terwogt, M. M., & Hoeksma, J. B. (2001). Colors and emotions: Preferences and combinations. The Journal of General Psychology, 122 (1), 5-17. 50.Trinkaus, J. (1991). Color preference in sport shoes: An informal look. Perceptual and Motor Skills, 73, 613-614. 51.Tutssel, G. (2001). But you can judge a brand by its colour: Consumer response to product colour was once about art. Brand Strategy, November, 8-9. 52.Valdez, P., & Mehrabian, A. J. (1994). Effect of color on emotion. Journal of Experimental Psychology: General, 123 (4), 394-409. 53.Vernadakis, G. (2000). What the 'bug' can teach gates: Brand personality goes a long way. Advertising Age, 71 (27), 48. 54.Walker, M. (1993). The Power of Color, Avery Publishing Group. 55.Wexner, L. B. (1982). The degree to which colors are associated with moodtones. Journal of Applied Psychology, 6, 432-435. 56.White, J. V. (1997). Color for Impact, Strathmoor Press, April. 57.Wilson, G. D. (1966). Arousal properties of red versus green. Perceptual and Motor Skills, 23, 947-949.